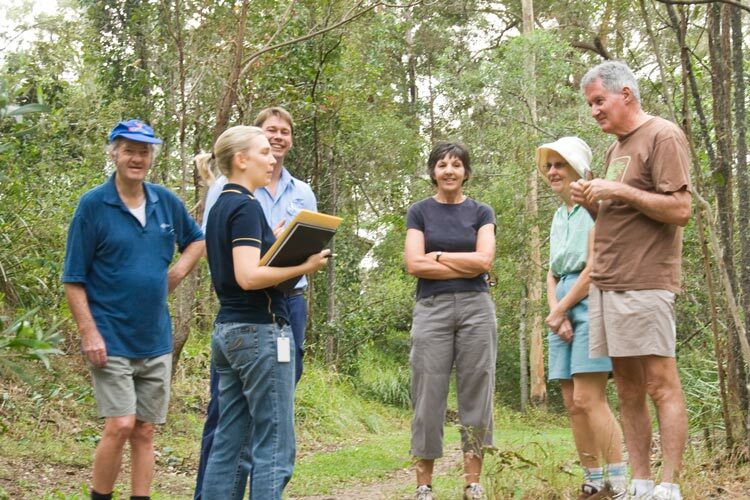 The association between Powerlink and the bush restoration activities of Wahminda Grove Bushcare Group began in 2008 after the company purchased a large tract of land along Kedron Brook at Ferny Hills. The property is adjacent to the Group's Bushcare site, that stretches along the public reserve on both sides of the creek at Ferny Grove and Ferny Hills. Powerlink has set the land aside for use at sometime in the future as a sub-station site, but only a portion of the property (on a platform with higher elevation back from the creek) was deemed suitable for this purpose. This private holding is severely degraded and is dominated by invasive weed species that are a constant threat to the adjoining rehabilitated sections of the Council reserve. 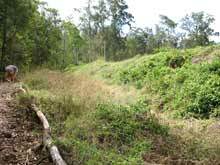 In late 2008, Powerlink agreed to a proposal made by the then Pine Rivers Shire Bushcare Officer (Adam Christison) for the Bushcare Group to revegetate a section of the unusable part of the Powerlink property along the top of the creek bank. 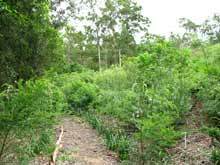 Over the next 12 months, the Group successfully removed the Lantana and a myriad of other weeds, and restored the habitat with native species, with Powerlink covering the cost of mulch and plants. 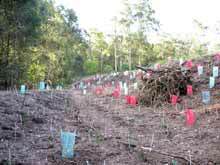 In September 2010 a proposal to further enhance environmental outcomes on this private property was submitted to the company by Anna Bourke (BCC Creek Ranger for Kedron Brook Catchment) on behalf of the Wahminda Grove Bushcare Group. The submission requested funding from Powerlink to assist in the rehabilitation of an additional and much larger portion of the unusable section of their property located between the future sub-station site and the creek. Notification was received in July 2011 that funds had been successfully obtained under the Powerlink Community Benefits Program. In the Project Agreement, involving a partnership between Powerlink, Kedron Brook Catchment Branch and Wahminda Grove Bushcare Group, Powerlink committed to provide funding of $20,000 to support a three-year bushland habitat restoration project. This total consisted of $10,000 for the first year and $5,000 for each of the second and third years. Work commenced in late 2011. Because of the scale of the project and the high density of weed infestation, an environmental restoration contractor was employed to treat the weeds with herbicide and to eradicate the large weed trees. Coupled with an additional $10,000 of contractor work (to tackle high priority weeds) offered by Powerlink after surveyor line-of sight activities resulted in damage to the newly established habitat restored in 2008/2009, significant progress was made with weed eradication over the next 3-4 months. Prior to planting, the areas above flood level were mulched, with the cost of transportation and mechanical spreading of the mulch consuming a large portion of the $10,000 funding allocated for the first year of the project. 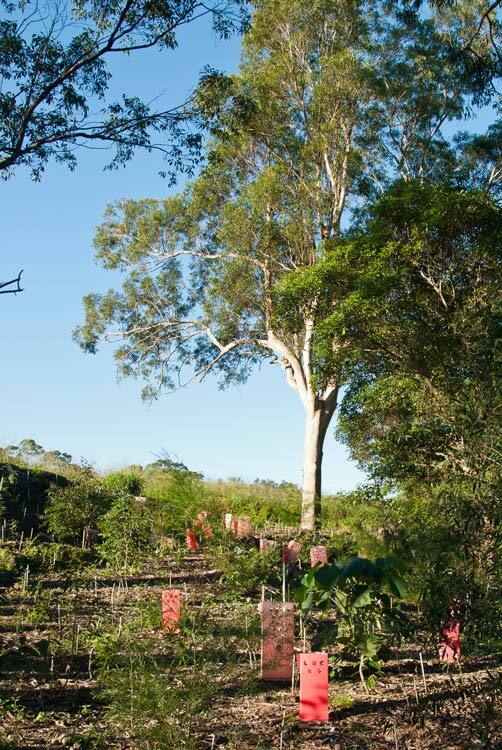 The Bushcare Group was able to commence planting the first stage of the project in February 2012, and planting sessions continued over the next 12 months with completion of the last stage occurring in March 2013. Approximately 3,700 native plants were used to revegetate the three stages of the project. The majority of these plants were obtained from the SOWN (Save Our Waterways Now) Nursery, The Gap. Most of the activities for the remainder of 2013, the second year of the project, involved weed control (both herbicide treatment by the contractor and manual weeding by the Group) and in-fill planting to replace losses and to improve stabilisation of the creek bank, taking the total number of native plants used so far to around 4,000. The majority of work to be undertaken during 2014, the third and final year of the project, will entail weed control and in-fill planting as required. The logistics involved with watering the thousands of plants in this project were challenging, and the long, hot dry periods experienced before the appearance of summer rains in 2012/2013 and 2013/2014 have taken their toll. However, despite the difficult and temperamental weather patterns, transformation from a weed-ridden eyesore to native bushland is occurring surprisingly quickly. The partnership with Powerlink has provided a rare opportunity to rehabilitate a large area of urban bushland on private property along Kedron Brook. The successful outcome of this project will bring significant environmental benefits by providing quality habitat for wildlife and by improving the water quality of the upper catchment of Kedron Brook, one of Brisbane's important riparian corridors. Lyn and Ann Ellerman are the contact persons for Wahminda Grove Bushcare Group and this project. For further information, please link to the Wahminda Grove Bushcare Group web site or contact Lyn & Ann by phone 3351 1805.